June is National Candy Month. So in its honor, I wanted to feature my favorite candy shops that you can visit in person or online. Sarris Candy: The Pittsburgh favorite, I have a lot of fond memories of Sarris’ Candy. This is where the Easter Bunny shops, so each year I would have the coolest and most delicious shaped chocolate. Their pretzels are also to die for and their parlor is too cute! I even looked into having my bridal shower here because a candy theme would be way too fun. Dylan’s Candy Bar: The brainchild behind this masterpiece is Dylan Lauren, the daughter of famed designer Ralph Lauren. I’ve blogged about Dylan’s before, because I’m obsessed, but just to remind you, this place has almost any candy created and the cutest accessories to match. If you can’t make it to New York, Dylan’s delivers the cutest treats. I especially like the Barbie line! Oh and Dylan’s also has a party room! SweetHarts: Melissa Joan Hart has created a candy store with a cute name and an awesome look and feel. However, I feel like this LA candy store is trying a bit too hard to be a west coast Dylan’s. Mr. Kites: Brady and I visited our local candy dude this past weekend for some ice cream on a beautiful afternoon. When I moved to Chicago Mr. Kite was one block away, right next to a flower store – perfect for dudes who like to romance their ladies. But due to a building renovation, Mr. Kite was forced to move a block away. If you ask me, this is a blessing, because his new shop is much better. Mr. Kite sells a number of homemade goodies. However, I don’t fancy his chocolate, but I think it's important to give your local business owners some love. There are also a number of online stores to satisfy your sweet tooth of fill up a candy bar at your next party. · Candy Warehouse: The name of this site says it all. I like how they organize candy by the type of event you may be hosting. 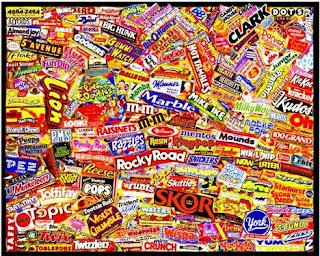 · Hometown Favorites: This site contains nostalgic candy and it even breaks down the treats by decade. I was a little upset they didn’t have Garbage Pail Kids in the 80’s. 200th Post & Exciting News!! !